With all my books I try to use a small element of current or historical facts as a faint (very faint mostly) backdrop – a peg on which to hang the story. This applies equally, whether I’m writing modern-day espionage thrillers or my 1960s French-based Inspector Lucas Rocco crime series. The first title back in 2010 was Death on the Marais, with a backdrop of wartime memories. For some of the older characters it was WW2 that formed them and their story, while Rocco is dealing with the aftermath of his own service in France’s lengthy Indochina war in south Vietnam which ended in 1954. For Rocco this is even harder to forget when he is posted from Paris as part of an initiative to spread investigative skills across France to cope with the spread of crime, and he finds himself living in a tiny backwater village and under the command of his former army C.O. 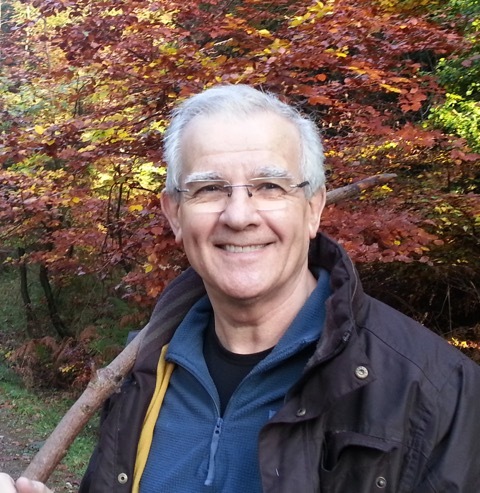 Francois Massin, now police Commissaire for the Amiens (Picardie) division. Having saved Massin’s life by dragging him off the battlefield during the senior officer’s blue funk, Rocco’s presence is clearly an embarrassing irritant Massin would rather forget. 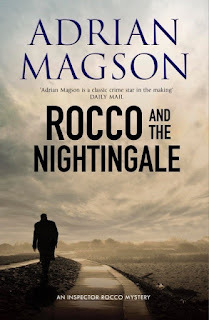 But policing is policing and criminals don’t stop for anyone, and the two are obliged to work together until, as Rocco suspects, Massin will be able to get him assigned to some desert posting in the middle of nowhere. 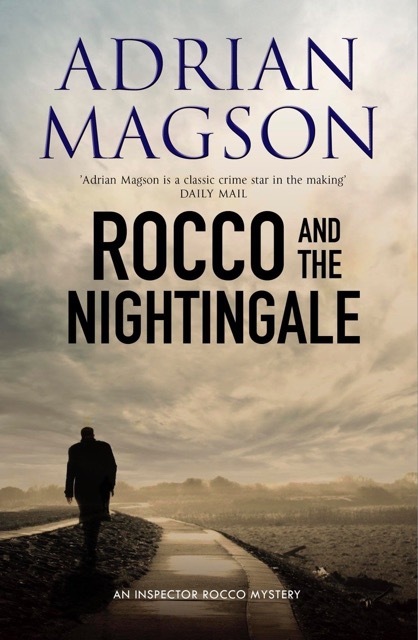 For now, a murder in the silent marshland around Rocco’s home base of Poissons-les-Marais carries all the hallmarks of privilege, secrets, links to the wartime Resistance and a VIP with a history in the SOE (Special Operations Executive) which for reasons Rocco has to uncover, he would rather forget. In Death on the Rive Nord, the backdrop is France’s history with Algeria, and that country’s eventual independence, with immigrants legal and otherwise, and criminals and industrialists trying to make a quick sou out of the situation any way they can. I used the idea of assassination attempts on President Charles de Gaulle (there were many, all unsuccessful – he really wasn’t popular in some quarters) for the background to Death on the Pont Noir. Playing with the possibility that a certain criminal gang from London, led by twins (I’ll leave it to your imagination), actually got involved in one on these attempts as a cover for a bit of cross-channel larceny, allowed me to bring in an example of British thuggery to mix with the French. In the fourth of the series, Death at the Clos du Lac, it was France’s expansion and trade with China and/or Taiwan that provided the background, with the kidnap of a wealthy aircraft manufacturer’s wife (a true event) as an attempt by certain opposition parties to derail the talks. 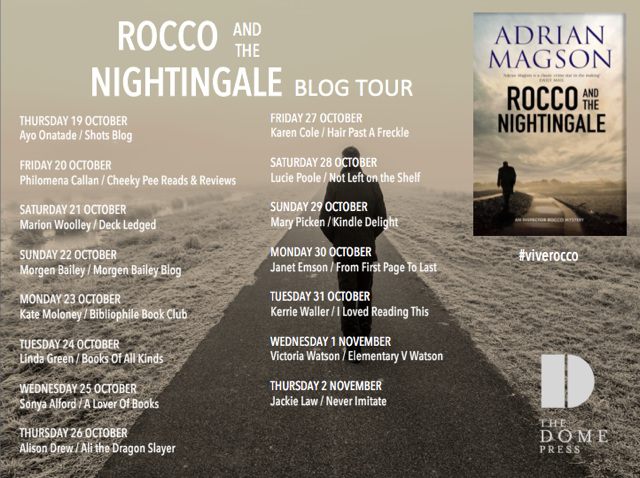 With the latest and fifth in the series – Rocco and the Nightingale – I used (very loosely) France’s connections with Gabon, its former territory in Central Africa. Since achieving independence in 1960, there have been a few changes at the top, one of the most recent being a former development minister, Antoine Bouanga, ousted by rivals and on the run seeking sanctuary outside Amiens. Rocco is ordered by the Interior Ministry to protect this man, overtly to show goodwill, but as cynics soon point out, because there is trade and money to be made out of the many mineral rights in Gabon, and maybe this man can help if he gets back in. Part of the backdrop here is personal for Rocco, however, stemming from book 2 – Rive Nord – and the death of a leading Algerian gangster, Samir Farek. Farek’s brother has taken over his brother’s criminal activities in Paris, and wants revenge for Samir’s death. To achieve it he hires a top international assassin to bring Rocco down. With a cast of regular characters from previous novels, such as Mme Denis, Rocco’s neighbour, the local garde champêtre Claude Lamotte, Commissaire Massin, Detective Desmoulins and, not forgetting the fruit rats in Rocco’s attic, it’s business as usual, but with plenty of action to prove that while this might be a rural backwater, crime is crime the same as it is everywhere else. Buy from the SHOTS A-Store at discounted price! Thank you very much for hosting this, Ayo, and supporting the publication of the book.